Commentary: This is not an action figure for kids. This Padme Amidala is a fantasy figure for adults. Her pants are very tight, her top is also very tight, it appears she works out, and her action pose lets her raise a gun and fire. Oh, and you can tie her up with the included chain. This is just a strange release given that in 2002, the big push for the new movie line was to get more kids to buy with the reduced price of $4.99 per figure at most stores. Her sculpt is pretty good-- if a little idealized. It looks more like Natalie Portman than earlier releases in the face at least, but the figure isn't suited to sitting in vehicles or doing much of anything but standing around and pointing her gun at enemies. This was enough, though-- a lot of non-fans and non-collectors picked up this figure in 2002 not because they were curious about new accessories or leaps in toy making, but because she was hot. It was, to say the least, a noble experiment. Collector's Notes: This figure, and a lot of white plastic figures from 2002-2003, have had a strange discoloration appear on them even if you never opened the figure-- a yellowish or greenish residue starts to appear on packaged or opened figures over time, like this Padme, the electronic beeping R2-D2 from 2002, and the ARC Troopers. This can be wiped off easily, but it appears on figures even if you store them in the dark under the best environmental conditions-- or so I've seen. Your mileage may vary. Commentary: Within the first three years of the modern Star Wars line, Kenner remade virtually the entire vintage line in those early days, including obscure aliens like Saelt-Marae, better known to you and me as Yak Face. He's been described as a Muppet, as Joe Camel, and as a part of the male anatomy. No matter how you see him, he's a very tall figure with six points of articulation, very good (for its time) decoration, and a vague similarity to the vintage figure. This new version has a bright orange coat, a nice big staff, colorful pants, and big white whiskers. With big hands that can grip the included accessory, this figure does basically everything you'd want it to do-- as in, stand in a diorama and look pretty. He can't sit in any vehicles, but he's sure to make any display just a little bit more visually exciting. There have been no rumors of a rerelease and next to no fan requests for a reissue or a resculpt, which is a little unusual as new collectors often express a strong desire for older figures to be made widely available once more. It's possible that Revenge of the Sith has shifted the focus of many newcomers away from what a lot of fans loved a decade ago-- seedy aliens, worn-out droids, and various Imperials-- to more of a focus on Clone Troopers and Jedi Knights. As such, I have no expectations that this figure will see another release in the near future. Collector's Notes: There weren't a lot of variants on this one-- he could come with a Freeze Frame, or not. As such, this figure has been rather unremarkable in the modern line unlike the basically legendary vintage figure made of Yak Face. This figure was a brisk seller in the markets I had the ability to monitor, outselling a number of figures that he shipped with like EV-9D9. Today, there is absolutely no problem getting this figure for its original price, or for even less if you're lucky that day. Commentary: A new line begins here! 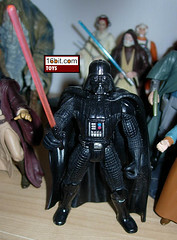 This Darth Vader figure helped kick off the modern action figure line, and was part of the first wave of seven action figures. (Although eight were on the cardback.) It didn't have the extra waist cape, the first release had a lightsaber as long as Darth Vader was tall, and the figure was muscular to a ridiculous extent. Still, it sold like crazy and when the variations started showing up, fans gobbled them all up. The sculpting is pretty good, the armor bits look like hard armor, the "cloth" bits look like leather (or are reasonably close), and the figure can easily sit down inside a vehicle. In many respects, this is a better toy than most later Darth Vader releases. Still, it's stylized, beefy, and not exactly what you would call authentic to any one particular version of the character on the big screen, so if you're a stickler for authenticity, you should pass on this one. Collector's Notes: There are many, many variants of this figure as it shipped for 3 whole years. It can have a long lightsaber, or a short lightsaber. It can be on a green cardback, an orange cardback, or a Freeze Frame cardback. It might have a sticker, and it might not. There are at least seven unique packaging variants out there, and that's not counting the "grey" plastic error Vaders that were produced as well. As such, if you want to collect a lot of variants of the same thing, this is a good place to start. Commentary: Few figures as insignificant (in terms of screen time and story) as Dannik Jerriko were given quite as royal a treatment, but in 2005, Hasbro gave three brand new Cantina characters the best figures you could hope for. With articulated wrists, knees, shoulders, elbows, neck, waist, hips, this figure has 12 points of articulation-- that's twice what the average figure had from 1995-1999. 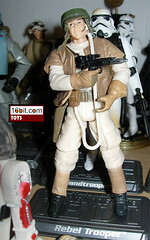 The figure has two holsters, one for his pipe, and one for his blaster. The figure also has two removable cheek extensions, which are good and bad-- it's a nice touch that Hasbro would include this rarely seen extra from the character's back story, but the problem is that when removed, you get two big holes in his face which aren't exactly the most photogenic. Since the figure can sit or stand well, has articulation most fans would be satisfied with, and just plain looks good for an action figure of this character, this is one you need to own. I'm not quite a big fan of the idea of the "brain vampire" when compared to the hairy cyclops in a blue suit or the tundra goat alien man, but hey, all the figures look good-- so why not add them to your collection? Collector's Notes: Along with Myo and Feltipern Trevagg, this figure was sold briefly in 2005 before Revenge of the Sith figures started to trickle out. These were in short supply in some markets and very common in others-- today, the figures are going to cost a little more than its original retail price-- but overall, this is OK, it's good enough to warrant a slight premium (unless you can find it for less.) Plus it has great packaging, and to date has not been planned for a reissue. Although if Hasbro ever does feel like rereleasing it with a hole-free head, I'd be all for buying it again. 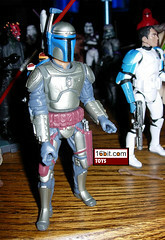 Commentary: After Hasbro made five unique versions of this character in 2002, every Jango Fett figure since-- including this one-- were reissues, resculpts, or mishmashes of those older figures. This particular version combines the "Kamino Escape" body and head with parts from the limbs from the "Pilot" version. At first, it's one of the best versions of the figure-- it has the most articulation (eight points), no action features, working holsters, a removable helmet, and it's painted quite well. In short, it's the best figure you could probably make from those existing pieces. Unfortunately the removable helmet, which was once very cool, doesn't seem quite as good today-- its rubbery thin plastic is so tight that you have to position it carefully on Jango's head so that you don't see the nose pushing against the visor. As a toy, a removable helmet is a nice play feature, but as part of this 30th Anniversary Collector Tin Set, it might have been nicer to see a new helmet of a thicker plastic, or possibly just a normal, non-removable helmet used. (After all, you can see a bit of neck.) So for today, this may be the best Jango Fett money can buy, but it also serves as a reminder that another, "ultimate" version is still very much in demand. Collector's Notes: The prequel-based tin packs flooded the market in late 2006, and some markets seem to have sold through most of them in early 2007. It's my understanding this SKU should ship for some time, but it might not be a bad idea to pick up this pack when you see it if you really want one as some stores (like many Wal-Marts) are finished with it. 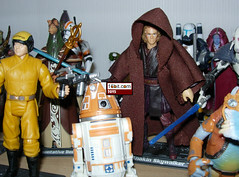 The set also includes a Clone Trooper, Count Dooku, and Anakin Skywalker. Commentary: Emperor's Wrath, Round II. This Darth Vader is based on a mold from 2001 which represented the same scene-- except this one has a newly retooled right arm and hand, newly retooled energy boogers, and an overall better paint job. (Oh, and they dropped the glow-in-the-dark skull, sadly.) The figure has a great sculpt, decent articulation, and deco that's about as good as you can expect from a partially translucent, being-zapped-by-Sith-lightning figure. If you don't have the original "Wrath" Vader, this one is arguably better looking and makes better use of its accessories and features. Collector's Notes: This is what you call an "non-essential upgrade," as the original figure was good enough (or so we thought), we already had three other carded Vaders in 2006, and of course, it's very scene-specific. Still, it turned out nice-- when Hasbro wants to make it so you can't resist a remake of a figure you thought you didn't want, they'll turn on the charm. Still, it's a fairly common figure, so don't pay too much for this one if you want it. It'll probably get reissued soon anyway. Image: Adam Pawlus' computer desk on top of a "Groovie Ghoulies" CD. Commentary: Now this is how you do a good repaint. 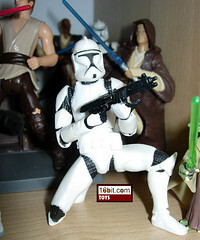 This Stormtrooper began life as a Sandtrooper in 2005, as part of the Evolutions line. To make the Stormtrooper, Hasbro dropped the shoulder pad and backpack, left off the dirt, and ta-da! Now you have a Stormtrooper. Of course, there are some imperfections, like the belt not quite exactly matching that of the traditional Stormtrooper, and the helmet having flatter lenses than a Stormtrooper. (That's one of the big differences between Stormtrooper and Sandtrooper helmets.) That said, this figure is otherwise excellent-- in the tiny size, the helmet lens issue really doesn't matter all that much. The belt is something most fans can ignore, because the lack of the grenade on the back and the missing holster really aren't deal breakers. The figure has a much better stance than what is usually considered the "best" Stormtrooper* and can be posed in pretty much any way you see fit-- it's only missing waist articulation for some reason. It's a good, solid trooper. It can sit down in vehicles without a holster getting in the way, it can pose with its gun, it can look around, it's nearly perfect. I say "nearly" because Hasbro's packaging damages the figure before you even open the box, because rubber bands that help secure the guns in the figure's hands cause the hand to become distorted and misshapen, so each figure has one hand that can easily grip the gun well and another that, well, is going to need some work. Still, for $20, this set gets you two Stormtroopers, two Rebel Troopers, and a Darth Vader you can ignore. That's a good value any way you slice it, and Hasbro would be smart to ship this set for as long as humanly possible. Or better yet, ditch Vader and the Rebel Troopers, add in another Stormtrooper, Commander Praji, and pack in Captain Antilles and call it "Capture of Tantive IV volume 2." Collector's Notes: Imperfections abound with this figure. The first packaged samples of this set showed "dirty" Stormtroopers, which resulted from a Sandtrooper mold being used and not fully cleaned up before its release. (This caused this Battle Pack to be delayed slightly.) Also, the final production samples had the belts put on backward. This is OK, if you open it-- the belt is fully removable and can be twisted around to look a bit more accurate. This battle pack also included a second Stormtrooper as well as Darth Vader and two Rebel Troopers, making it a dream set for many fans and collectors. By not buying this, you offend everything your parents worked so hard to give you. * - For the record, this "best" Stormtrooper is usually considered to be the 2004 Vintage Original Trilogy Collection release. Image: Adam Pawlus' Separatist Vehicle Shelf. 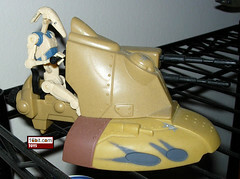 Commentary: While they appeared in both The Phantom Menace and Revenge of the Sith, to date there's only been one pilot version of the Battle Droid action figure produced, and this is it. It's a little stiff, with about five meaningful points of articulation, no blasters, and little in the way of dirt deco. Still, it looks cool, and is about as basic as you can get-- if this figure didn't have the blue shoulder markings of a pilot, there really wouldn't be much nice to say about it, aside from the fact that it came with a nice vehicle for the price. Unfortunately, there isn't much to it-- black eyes, blue shoulders, no accessories, and very little in the way of articulation means this figure can serve your armies as either a pilot for his vehicle, or shelf fodder. It isn't a lot of fun to play with by itself, but when combined with his miniature "scout" version of the Trade Federation AAT, it's totally cool for the money and well worth picking up. Collector's Notes: This item was sold in a closed box with a window revealing the figure, and in a window box with a diorama background showcasing the entire product. Considering this figure came packaged with a modern "Mini Rig" for $9.99 when basic figures sold for $6.99, it was an excellent value. Image: After patrolling Kamino, the figure takes a moment away from exploring for a photo shoot on Adam Pawlus' stairs. Commentary: In 2003, fans (including myself) were screaming for more Clone Trooper figures as Hasbro seemed to be going out of their way to make them hard to get, and a real lack of variety didn't help things. So in 2004, Entertainment Earth came to me and said "we want to do some Clones with Hasbro, what should we do?" So after some harassing of many people, I got what I wanted-- four packs of four, with all ranks, and battle-damaged figures too! This yellow Clone has 14 points of articulation, most of which are basically ball joints, and the ability to carry pretty much any weapon. As far as articulation goes, this is one of the best, so be sure to get it if you see it. 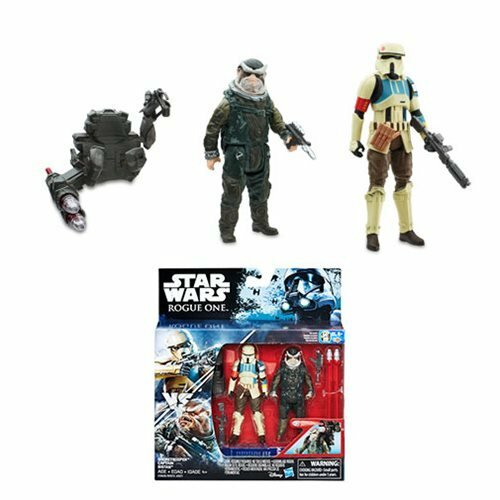 In addition to this figure, there's a Yellow Clone Commander in the Wal-Mart 2-packs based on a different, less articulated sculpt, and another one in the Clone Wars 3-packs that includes binoculars. And, of course, a battle damaged version of this one. Action Feature: Squeeze legs for slashing attack! Image: Adam Pawlus' 2006 toy shelves. 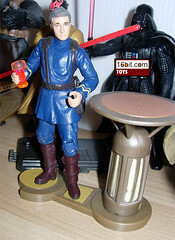 Commentary: Say what you will about plastic reruns, but Anakin Skywalker sells. Kids buy him, so we'll be seeing reissues here and there. This particular figure was based on the 2005 release, but added a display base and a cloth cape while removing the red lightsaber. The figure has a slashing attack, which, well, is good and bad-- action features make it hard for figures to sit down. Still, he has plenty of articulation, and the idea of having his hand swap out was a good one-- this way, it's a little harder to lose the lightsaber when he's slashing his arm around. Still, he can sit, he can fight, and he has a good sculpt-- it's a solid action figure, and as a toy, it works. Collectors may wish to get something with more accessories and articulation, and they can find that with other releases-- but this one is still very, very good. Collector's Notes: The same basic sculpt was used for multiple releases, which probably means you won't necessarily want to or need to buy this one. It was released on a basic card in 2005, with no cloak, 2 lightsabers, and an extra hand. In 2006, the aforementioned 2005 version was released in new packaging (Episode III Heroes & Villains). It was packaged with the exclusive green Jedi Starfighter, the exclusive Kmart Jedi Temple Assault set, and well, let's just say if you're a carded collector you'll have close to a half dozen of these already. Also, for the collector who has to have it all, Hasbro released a limited number of "Ultimate Galactic Hunt" versions of this figure-- it came on a special package with a silver display base, a silver logo on the package, and a faux pewter "holographic figure." It's pretty slick if you can track one down. Commentary: This figure can thank the fans for its presence in the line-- during the fourth Fan's Choice poll, General Jan Dodonna tied for winner with Captain Antilles, so Hasbro decided to make both. Why Captain Antilles got the "Fan's Choice" graphics on his packaging and Dodonna didn't is beyond me, but hey, at least we got the figures. The figure had a great sculpt with just enough detail, good deco, and nine points of articulation. Of course, the legs were somewhat hindered by his giant coat, but such is life. This figure is really a display piece more than a toy, so if you get it, don't expect it to go piloting your vehicles for Rebel missions. It can, however, stand around for Rebel briefings, and that's a good thing. For collectors, this is a great figure for so many reasons. It's the first time this character saw the world of action figures, showing that even after two decades, Hasbro still keeps thinking about which characters to immortalize in plastic. The medals aren't exactly necessary, but are a nice touch-- be sure to pick this figure up if you have the chance! Collector's Notes: This figure was never repackaged or reissued-- you had one shot at him in 2004 and that was it. He wasn't the strongest seller of the time, but he was a really great figure and collectors everywhere were pleased Hasbro produced him. He should be easily had for his original retail price (not including tax and shipping, of course) so there's really no reason to wait for a reissue that will likely never happen. Also, a lot of fans say Hasbro doesn't do Rebel officers, but aside from Dodonna, Hasbro has made quite a few. In 2004 alone, they cranked out General Rieekan, General Solo, General Calrissian, General Madine, and Captain Antilles-- and this was all before Summer, too! Commentary: This particular version of Han Solo both kind of did and didn't appear in the movie. In a brief shot, you could see an AT-ST Driver message inside the Imperial Bunker for help, and according to the script, that's Han in disguise. The movie went by really quick so most viewers never could figure out who it was supposed to be, but Hasbro picked up on this and cobbled together a figure based on this scenario-- and it's pretty cool! They took a 2001 Imperial Officer, gave it a new head, retooled a hand and gave it a communicator, and after adding a helmet, came up with this nifty design. The articulation is good, he can sit inside a vehicle, and is arguably the best AT-ST Driver to ever be sold on an individual card-- except for maybe the 1984 Return of the Jedi release. Still, with 10 points of articulation, he's plenty good and overall better decorated than the version packaged in the Toys "R" Us exclusive Imperial Forces gift set. Plus there's really nothing better than a figure in disguise-- it's like getting two figures in one! Collector's Notes: This figure was repackaged in late 2004 in the Original Trilogy Collection packaging, which was (in most markets) much more common than the original Saga version. It also looks a lot better. Commentary: Hasbro realized that fans loved Clone Trooper figures, and devised a way to give us a bunch of them quickly. This figure, along with a few others, were packaged in "Clone Army" three-packs, and each figure had limited articulation, limited deco, and in some cases, limited distribution. Between five unique configurations of these three-packs, Hasbro made a grand total of eight different Clone Trooper figures (kneeling, kneeling green, binoculars, binoculars yellow, sniper, sniper red, standing, standing blue) so to "collect them all" you'd have to spend at least $40, as the all-white set had figures that could be found in the other packs. Naturally, the white one was the most common. This figure is the white kneeling variation, which was packaged in a few other sets and, sadly, doesn't move much. The head moves, the waist and writsts move, and aside from that you can't get a lot out of this figure. He's great for dioramas or certain places in a Gunship, but really, he's just a static trooper-- for the money, he's a good figure, but with only a little black paint and no articulation, it's not exactly a lot of fun to play with. Although it is durable and as the gun is molded to his hand, you're fairly unlikely to ever lose it. 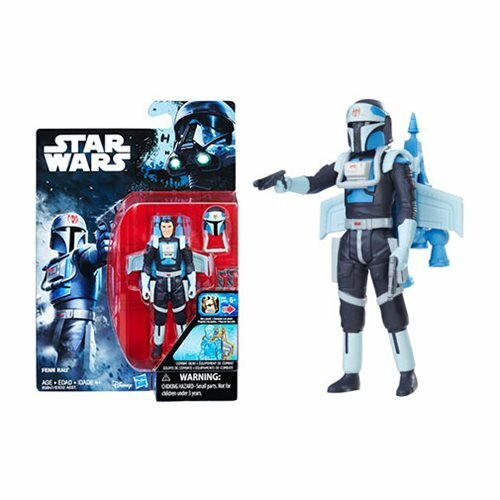 This is a figure you should get if you're a big Clone fan, otherwise you probably won't get a lot out of it. Collector's Notes: Given the many configurations of this figure (and the fact it was retooled for Revenge of the Sith), fans weren't left very excited by it. There are lots more white Clones that do more than this one that are just as easy to find, so if you want this one, odds are it won't cost you very much. Also, for the super-complete collector, remember there are only five configurations of this set-- Hasbro didn't make the Clones in every pose with every color, they only come in white or one other color. Image: Adam Pawlus' pile of stuff. Commentary: There's not a lot of action in this figure. Oppo Rancisis came as one of the first Saga Scene sets, and was obviously designed primarily as scenery. He has a bendable tail, limited arm and wrist articulation, and that's about it. Without his chair, he really can't do much other than fall over. 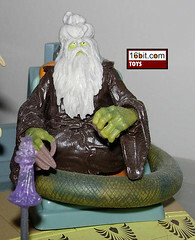 In the movie, this snake-like alien didn't do much other than sit, so it's not an inappropriate figure-- on the contrary, the toy probably does more than his on-screen ancestor. Since he can't possibly stand on his own (or with a display stand), it's a figure that probably stands little chance of seeing a reissue on an individual package-- of course, that hasn't stopped Hasbro before. The sculpt is good, the textures are excellent, but the final product is somewhat boring. The figure has all the fun and excitement of a drunken uncle over for Thanksgiving that passed out watching football on the La-Z-Boy. It's a curiosity to look at-- but otherwise, odds are you don't want it in your house. Collector's Notes: This figure is part of an overall fairly strong set. It was originally packaged with the nicely sculpted Even Piell and, at the time, the best-ever Mace Windu (with soft goods and extra articulation). So if you buy the set, it's a very nice set. If you just buy this figure, well, as a collector you may enjoy it. In and of itself, Jedi Master Rancisis is a little bit dull. Commentary: A common complaint with collectors is that Hasbro doesn't make enough, in terms of quantity or variety, of "trooper" figures. In 2006, they went all out by releasing a whopping three unique Rebel Troopers based on the uniforms used on Endor. There was this one, another one based on this configuration, and another one based on the "original" modern 1998 figure with a new head. This figure is cool for a variety of reasons-- one of which is in the notes below. The figure itself, though, is based on a 2002 action figure but with a new head, new deco, a new belt, and new legs. In other words, they changed the figure just enough for it to be basically brand new, and as an added bonus, a repaint (or really, the original paint) of the figure has darker skin and slightly different decoration, thus making it yet another totally new figure. The added knee and ankle joints make this figure just a little more fun to play with, but the jacket and arms are what could probably have used the most enhanced articulation. Still, as you're probably going to buy this figure for your Falcon's gunner crew, articulation may not be your main reason for making the purchase. There's a lot to like here-- it's a good figure with neat accessories, good articulation, and as an added bonus, he has a little extra history behind him. While we've been given more than enough Endor Rebel Troopers over the years, they're all unique and have some compelling reason to pick them up-- especially this one. So go get one. Collector's Notes: While not explicitly named as such on the packaging, this particular Endor Rebel is based on a publicity still that was eventually developed into a full character by the expanded universe. Airen Cracken is apparently this Rebel's true identity, and he's best known as one of the gunners on the Millennium Falcon while Lando Calrissian took the ship during the Battle of Endor. So hey, it's almost an Expanded Universe figure! 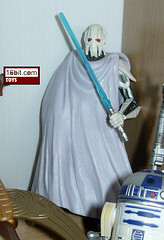 Commentary: While he wasn't as popular as some characters prior to his appearance in the movie, General Grievous was redesigned to become several unique action figures. Some just look decent, others have a four arm attack. This one explodes, awkwardly. It doesn't hold together especially well, as the figure tends to split at the waist very easily. It also doesn't like to stand up on a shelf over long periods of a time. In short, the "action" ruins the figure. While the idea was cool-- exploding torso with guts inside-- the end result is a figure that doesn't make for a very good figure with weak legs and surprisingly good paint. Unfortunately, the cloak in this configuration is probably something fans don't want, so if you're looking to skip a Grievous, this is the one to skip. 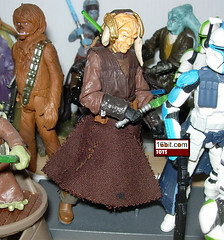 Collector's Notes: In 2006, the figure was released in the first waves of the "Episode III Heroes & Villains Collection." In later assortments, the figure was replaced with the four-armed version, which was more stable and gobs more fun. The figure is cheap but even so, cheap doesn't necessarily mean you'll want to add it to your collection. For those who leave their figures packaged, though, the Heroes & Villains version is pretty nice. As a toy, though, it's really no fun-- as a collectible, it tends to fall over, as the legs are weak and even a stand can't help it stay upright. This is a figure that, with any luck, will never see retail pegs again. Commentary: With Episode I, Hasbro was faced with a challenge-- how do you make new versions of the film's most popular character when he has basically two costumes and dies? Darth Maul was given the royal treatment, with deluxe figures, basic figures, holographic figures, and this concept art-based figure. With extra (and arguably goofy) armor, this figure allows kids to play with Darth Maul in a new scenario, and acts as a harbinger of things to come-- namely this year's McQuarrie collection. Concept art figures have been around for a while, but this one is unique in that it takes elements of the original illustration and combines them with the character from the final film. The figure is pretty fun, but can't stand up without a stand and can't sit down in a vehicle. So basically, if you're buying this figure, you're buying it because it looks cool. And if you don't think it does look cool, you can save yourself a few bucks by buying something else. Collector's Notes: This figure's one big flaw is the silver paint on his lightsaber-- it's very likely to come off on the figure's hands over time. As such, be careful with it. 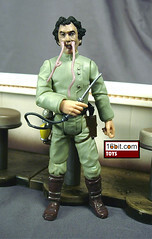 This figure has never been reissued and I don't expect it to see a new release any time soon. Commentary: The face that launched a thousand sales. This is the very first action figure of the Clone Trooper, and it was initially available in fairly limited numbers a few months before its debut in the "moving pictures" at your local theater. 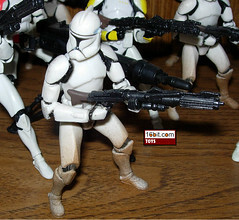 This figure captured the all-digital troopers with six points of articulation (which, for the time, sucked) and dirty leg decoration specific to the battles of Geonosis. With limited articulation and very specific deco, there were lots of opportunities to revisit this figure, and Hasbro more or less decided against this. But more on that later. This figure is pretty much good for dioramas, as its dedicated pose doesn't allow it to do much in the way of sitting back or looking normal. This is not a lover, it's a fighter. So if your dioramas need more fighting figures, this is an excellent addition to your collection. The basic Clone doesn't have a lot of room for subtlety in its deco, as it's a white figure with some black on it, basically. This figure manages to meet those expectations quite well. In 2002, Hasbro released but 3 Clone figures-- this one, a red redeco/retool, and the Pilot. That's it. They were a little more adventurous at the end of 2003, but the manufacturer tended to be really conservative with their Clone releases until Revenge of the Sith, and it turns out that fans would buy pretty much every figure presented to them. So this figure was a great start of a huge collection with no end in sight. Collector's Notes: Depending on where you shopped, this figure may have been in short supply or on clearance. I bought several at full price, and several at about $1 and change on the Target clearance rack. This mold has never been reissued or redecorated (except for the aforementioned retooling), so if you want one, happy hunting. A lot of fans don't like this figure just because it doesn't have twice the articulation, but it's still very good for what it aspired to be-- a sneak preview into the second-to-last Star Wars film. Commentary: It's not every day Hasbro designs a figure with battle-damage, the ability to sit, and the foresight to use it as a pilot for a vehicle that would come a lot later. (Of course, as it was using a ship mold from 2002, it's not a stretch.) Saesee Tiin has been given four figures, all of which are pretty excellent. This one is the most fun as far as a plaything goes, as it has gear, can sit in a ship, and just plain looks good. His face has a lot of deco and detail, his costume is just improved enough from the movie one to look tough without looking goofy. The gloved hands were a nice touch, and it's great to see Hasbro gave this figure an entirely new sculpt rather than churning out a variant of an existing product with slightly different limbs. If you're a fan of good figures, this should be on your wish list. And if you bought the bright orange Saesee Tiin's Jedi Starfighter vehicle, consider this action figure a must-buy. Collector's Notes: What's notable-- and unfortunate-- is that the design on the cartoon Clone Wars was even cooler than what Hasbro came up with for this action figure. In the animated series, he was given some space armor that was a mishmash of this figure and the aesthetics of the Clone Trooper. It's awesome. Gentle Giant is making a Bust-Ups micro bust based on that design, but Hasbro has yet to commit to an action figure based on the design. (But a Transformer? Yes.) This figure can be had fairly cheaply, so you shouldn't have to pay too much more than $10 shipped for it if you're patient and do enough hunting. Commentary: In 2003, Hasbro let us know we'd be getting not one-- but two Imperial Dignitaries. Kren-Blista Vanee was the second of two, and was a figure that shared parts with the first Dignitary Janus Greejatus. The figure is basically a statue/chess piece/salt shaker, with articulated arms, wrists, and neck-- anything else is rendered immobile through the large robes. Still, this isn't a figure that's meant for action, or sitting in vehicles, or really doing anything other than standing around for dioramas and publicity stills. The head sculpt is good, the coloring adequate, and the hat is funny. It has all the makings of a good human Star Wars figure, except that it's lacking in "oomph." It is what it is, so if you like how it looks, that's about the extent of joy it can provide you as a plaything. Collector's Notes: The clearance racks made this one an easy find, and there just aren't that many people who are jazzed about old men in purple dresses with no dialogue and tongue twister names. 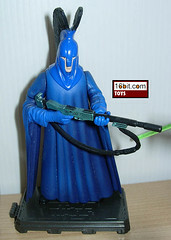 While this figure hasn't been reissued, it may have come close-- in the 2005 Kmart Imperial Throne Room Battle Pack, it was pictured on the back of the packaging. The other Dignitary was included instead for reasons unknown. 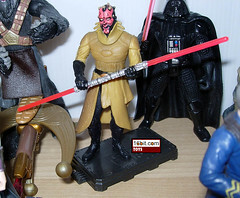 Commentary: At one point, the idea of a magnet in a Star Wars figure was just exceedingly exciting-- this Darth Maul, though, was the second Maul to have a magnet and split down the middle. The first was in a two-pack to celebrate the VHS release of Episode I. This one, though, was pretty cool too-- you get half a lightsaber, and if you flick him just right, he splits apart. He has six points of articulation (assuming you can count the waist as a joint), and is decent enough to warrant buying. His head was a little brighter than other Mauls available at the time, and his horns were painted better than any Darth Maul available at the time. So as far as deco and sculpt go, this was a great figure-- it was unfortunate that Hasbro decided to not paint his teeth, as this striking feature is worth decorating if a figure is sculpted with an open mouth. He'd look just a little more menacing that way. Collector's Notes: When I first saw this figure, my complaint was "what, again?" 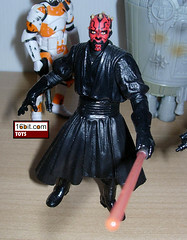 There are two very similar Darth Maul figures with unique sculpts and the same action feature. Some like this one more, others like the other one more. I like them each for different reasons, but since this is a fairly common figure you should be able to get one on the cheap. Commentary: Does the world need another Gran? I'd say yes. Ask Aak is the second member of the Ree-Yees species, and this is easily a better figure than the 1998 version of the Jabba's Palace drunk. Ask Aak has a ball-jointed neck, and basically just enough articulation to make you both happy and mad. He isn't super-poseable, but he's certainly good enough. With various textures in his sculpt, it's obvious a lot of work went in to the figure's bumpy hands, hairy coat, and nasty, alien feet. A lot of work went into this figure, and it shows-- so pick one up if you have the means. 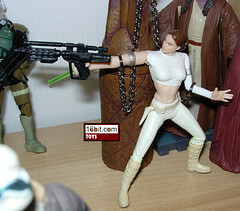 The figure includes a redeco of the 2004 Bossk gun. Collector's Notes: Since the prequels were lacking in really good creature showcases like Jabba's Palace or the Cantina, you're going to have to settle for Pod Races and the Senate. (And to a lesser extent, the Outlander Club of Episode II.) This nifty figure shows that if the story went in a slightly different direction, we could've had dozens of really cool random alien figures instead of what we got for Revenge of the Sith, which was mostly new versions of characters we already got. Oh well. Either way, it's a nice figure. Commentary: Does the idea of owning toys based on a cameo excite you? Allow me to introduce Lt. Dannl Faytonni, who is Anthony Daniels (C-3PO) outside the robot suit. The figure has an excellent range of articulation, a working holster, and a great sculpt-- and the same body was reused for another figure later, but that's OK as it's a good figure. 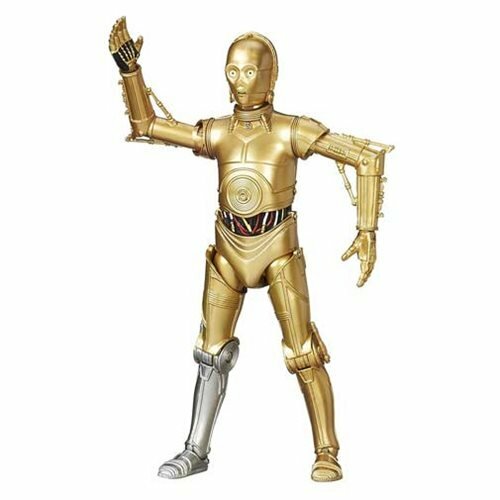 The main appeal of this figure is the fact that it's Anthony Daniels, and customizers will probably take this figure and a C-3PO and bash together something really cool. For the rest of us, it's just an amusing character that is basically scenery-- and he includes some scenery, too. It's worth snagging if you see one. Collector's Notes: A wacky cameo with loads of articulation and great accessories? How can you go wrong? You gotta buy one. Commentary: It's good. The Coruscant Guard is basically a tiny statue, but not a bad one. He's articulated at the shoulders and elbows, and aside from arm movement there's not a lot this guy can do. He has quasi-Kir Kanos armor under his robes, but odds are you'll never actually see it. He can hold his rifle. He can stand there. And that's about it. His robes are pretty good, and this figure is about as good as you can expect from this character design. Later films used a different helmet, and the figures from that costume had much more articulation and cloth robes. Arguably, those are better-- but this one is pretty cool, what with its fancy faux-Greek motif and all. Collector's Notes: This figure was originally going to be part of the ongoing Episode I line, but obviously that came to a fast end. Packaged Episode I samples exist, so if you're really feeling generous, you might want to go buy one of those. It's worth picking up a couple of these if you have the means. Commentary: I'm a huge fan of the Max Rebo Band, so you can imagine my excitement/rage at the announcement of these being a Wal-Mart exclusive in 1998. Sy Snootles was the second of three two-packs, and included the only computer generated aliens to be released from the musical group. Sy Snootles' 1997 makeover had her a little thinner, a little more cartoony, and significantly more animated than her 1983 puppet predecessor-- and the figure reflects this new look quite well. Unfortunately, the new song, lack of a feather on her head, and other minor changes made a lot of fans cry out for a new version of the 1983 figure, and I have to say I agree with them. For what this figure aspires to be, it's quite good. She has five points of articulation and a pose which makes her look like some sort of singer, rather than a generic boring pose like a lot of figures over the years. Of course, she was made back in 1998, and it's a safe bet that fans are ready for a new version of this figure. Early test shots of this figure showed a microphone, which was ultimately not included because it didn't appear in the movie. 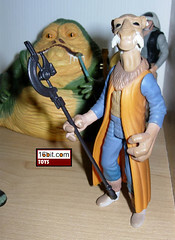 Fan-made accessories do exist, though, so you may wish to buy those if you absolutely must have a mic for Sy Snootles.